MacuHealth with LMZ3 is a unique and patented formulation specifically designed to rebuild and maximize macular pigment over a lifetime. Containing all three critical carotenoids in a patented 10:10:2 ratio consisting of Meso-Zeaxanthin (10mg), Lutein (10mg) and Zeaxanthin (2mg), MacuHealth with LMZ3 is proven through peer-reviewed research to quickly and effectively rebuild macular pigment. Whether you’re at risk for macular degeneration or you’ve already been diagnosed with the condition, you want to do everything possible to improve your ocular health. 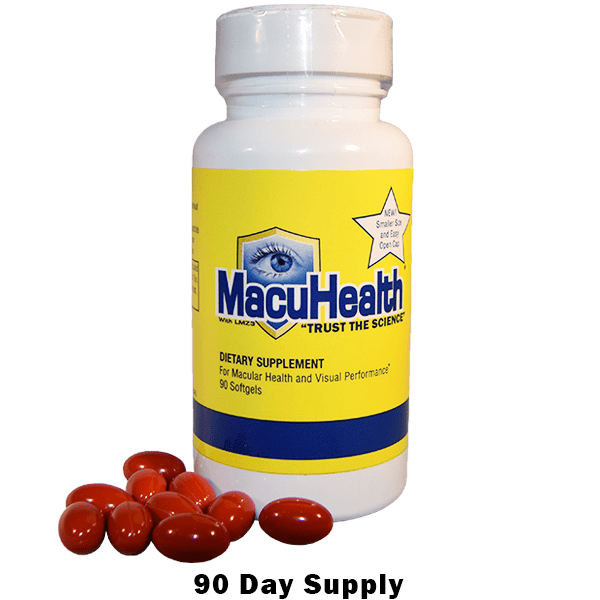 MacuHealth offers eye vitamins for macular degeneration to help anyone with the condition rebuild and maximize macular pigment over his or her lifetime. Our eye vitamins also provide blue light protection so that your eyes can truly rebuild macular pigments and help you see clearly. This treatment for macular degeneration stems from a unique patented formula to rebuild your eyes natural macular pigments and to maximize that growth over a lifetime. Our vitamin contains all three carotenoids your eyes need to stay healthy: Meso-Zeaxanthin, Lutein, and Zeaxanthin. Peer-reviewed research shows this vitamin’s proven effectiveness as a treatment for macular degeneration. As you take this vitamin consistently, it will improve contrast sensitivity and reduce glare to improve your eye’s overall visual performance. Additionally, by increasing your macular pigment production, this vitamin helps reduce and limit oxidative stress, or the injury free radicals cause your eyes. With this added protection, your eye’s cells are safeguarded from damage and your risk for blindness later in life is reduced. Take the first step in safeguarding your future by purchasing our eye vitamins for macular degeneration. Our product is recognized and approved by Informed Choice and Informed Sport, and we thoroughly test each capsule’s purity and contents so that you are getting exactly what you expect in each bottle. Read the information below for more specifics about this treatment for macular degeneration. If you’d like to order, use the links above to add products to your cart and proceed with checkout. If you have any questions, feel free to contact us anytime. A natural extract product rich in the carotenoids Lutein, Meso-Zeaxanthin and Zeaxanthin. These carotenoids are obtained from a natural source: Marigold flower petals through our patented processes. They are recommended as a food supplement to provide necessary carotenoids required for a well-balanced diet. Carotenoids are well-known for their chemical and biological properties, especially in disease prevention*. The sunflower seed is the fruit of the sunflower (Helianthus annuus). Striped sunflower seeds oil is used as a carrier by MacuHealth for the three active ingredients. The oil protects the product from being degraded by oxidation, which decreases the carotenoid content and effectiveness. Beef Gelatin 37.5 mg – This food grade and FDA sanctioned beef gelatin is used as the envelope for the manufacturing on our supplement. Annatto – This natural red plant extract is used to create the red color of the capsule. Annatto comes from achiote shrub seeds, and is mainly used as a red food coloring. Produced in South America, achiote seeds have been used by tribes for centuries. These natural ingredients allow MacuHealth to keep its product with the appropriate homogeneity. This anti-oxidant is used by MacuHealth to slow down oxidation of the raw material thus maintaining the integrity of the product. I’ve used this product for 7 years and think it is great. It was recommended by my eye doctor and we are both pleased that my macula has actually improved slightly. With a family history of macular degeneration Macuhealth is a critical factor in preventing the poor outcomes of my relatives in generations before me.